WCPE’s Music Director William Woltz announces Primarily Piano Weekend on May 12-14, 2016. 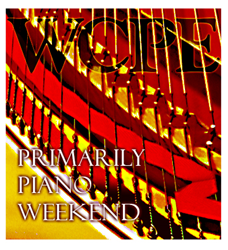 WCPE’s Music Director William Woltz announces Primarily Piano Weekend on May 12-14, 2016. The program will feature great composers as well as virtuoso performances. Also the Saturday Evening Request Program enables listeners to add their favorite composers and performers to the playlist. http://theclassicalstation.org/features_request.shtml is the link to the SERP request page. WCPE can be heard worldwide, 24/7, via the Web in multiple streaming formats, including the next generation IPv6. Visit TheClassicalStation.org/internet.shtml to begin listening online. Across North America, WCPE can be heard through cable television and radio transmission affiliates. For a complete list of affiliates and cable broadcasters, visit TheClassicalStation.org/rebroadcasters.shtml and TheClassicalStation.org/cable.shtml. In central North Carolina and southern Virginia, WCPE is found on the radio at 89.7 FM. For more information on WCPE, or to print a downloadable version of Quarter Notes, the WCPE member’s magazine, please visit TheClassicalStation.Org. With a 38 plus year history, WCPE 89.7 FM is a non-commercial, 100 percent listener-supported, independent station dedicated to excellence in Great Classical Music broadcasting. WCPE is heard worldwide on the Internet in multiple formats, including the next generation IPv6. Because WCPE receives no tax-derived support, the station conducts two on-air fundraising campaigns and two major mail-out campaigns per year to raise needed operating funds. For more information, visit http://www.TheClassicalStation.org or call 919-556-5178.